photo-Jessica McConnell Burt/George Washington UniversityBrian Williams, who delivered the commencement speech at the 2012 George Washington University graduation ceremony, receives an honorary degree from the school. There were blue skies over the National Mall, and it was packed with jubilant George Washington University grads in caps and gowns and a bevy of appropriately dressed parents sitting on folding chairs on the lawn. So sunny, we moved our chairs under the shade of a tree. My husband, my children and I had flown to Washington, D.C., from Los Angeles as my son Ethan Harari is a proud member of the G.W. graduating class. 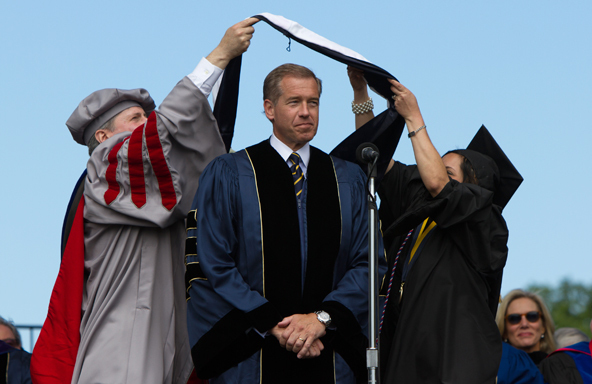 As Brian Williams stepped up to the podium to deliver the commencement speech, the skies turned dark. Brian Williams smiled and said something like, “Perfect,” as it in some way mirrored his checkered collegiate past. He’d managed to amass 18 credits (at three colleges) before dropping out of the very same George Washington University’s night school. He had a good excuse — he was an intern at the White House and had an access-all-areas pass. And he couldn’t afford college. He was, also, wearing a cap and gown (with a brilliant black and white diagonally striped tie peeking out from his collar) as G.W. was giving him an honorary doctoral degree. I want one. Like Brian Williams, I didn’t go to college. I finished high school during a winter session and when fall came around I was a working journalist, my family was somewhat dysfunctional, and, at the time, not going to college was a legitimate choice. I always wanted to start a society of people who didn’t go to college, kind of like that society of people who went to Harvard or G.W. Not that either Brian Williams or I am advocating not going to college. I love Brian Williams. He makes me feel calm. He seems appropriately astonished and interested in the news he delivers, which may have as much to do with the pitch of his eyebrows as the tenor of his voice. I feel the same way about him that my mother felt about Walter Cronkite. Curiously, Walter Cronkite delivered my high school commencement speech. I attended a small boarding school in Vermont, and his daughter was in my graduating class. Everyone was excited that Walter Cronkite was giving our high school commencement speech. He talked to us about robots. The entire class’s eyes glazed over. He told us that by the time our children graduated from college, the world would be run by robots. We wanted him to tell us that the world was our oyster, that we had infinite possibilities. And he was talking to us about robots. The girls in the class wanted him to talk about equality, how we could break the glass ceiling, and that there was a place for us in the work force. And he was talking to us about robots. He wasn’t wrong in some ways; he wasn’t entirely right. I’m still missing that robot that was supposed to bring me coffee in the morning. 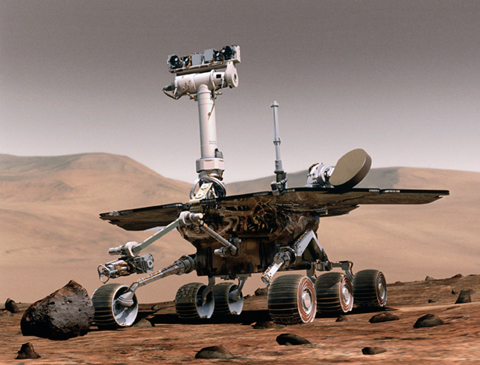 A computer rendering from NASA of one of the Mars rovers. We weren’t really sure about Walter Cronkite’s politics. He didn’t make regular appearances on nightly talk shows. In those days, newscasters were supposed to keep their opinions to themselves. But the one thing we knew about Walter Cronkite was that he loved the moon. He loved the space program. The first Apollo mission was set to launch in August the year I graduated from high school. And the most searing, powerful robot image I’ve ever seen, which reminded me of Walter Cronkite, was of the Mars rovers. They almost had personalities. They had names. Two of them were called Spirit and Opportunity. We lost contact with Spirit in 2010. Opportunity is still operational. A third rover, Curiosity, is on its way now and is expected to land on Mars in August. And I suspect Walter Cronkite loved them as much as I do. Brian Williams, who is the anchor of the NBC Nightly News and the host of the news magazine show “Rock Center,” has pitch-perfect comedic timing, as evidenced by his appearances on “The Daily Show,” and whose politics seem slightly more transparent from same, also loves the space program, but more about that later. He also knows a little bit about the potential difficulties for recent college grads, the difficulties of being in your early 20s in 2012. Allison Williams, his 23-year-old drop-dead-beautiful daughter, who graduated from Yale, is one of the stars of the Lena Dunham-created HBO series “Girls.” The world is somewhat divided on “Girls.” Girls are divided on “Girls.” You either think it’s hysterically funny or deeply depressing. There doesn’t seem to be much in between. (Note to all: do not pretend it’s “Breaking Bad” and watch five episodes in a row.) But just the fact of “Girls,” the fact that it’s on the air — in what has been a banner year for women and female-driven entertainment that is not the lighthearted norm (“Hunger Games” comes to mind) — is an extraordinary achievement. But it sort of gets under your skin and I can’t help but tune in to see what horrible thing Lena Dunham’s character is going to do this week, what “out there” thing Jemima Kirke’s character will do or what silly thing will happen to the frozen virgin. Allison Williams, following in her father’s footsteps, is in some way the anchor of “Girls,” the most stable one, but she’s probably about to do something really dumb, too. 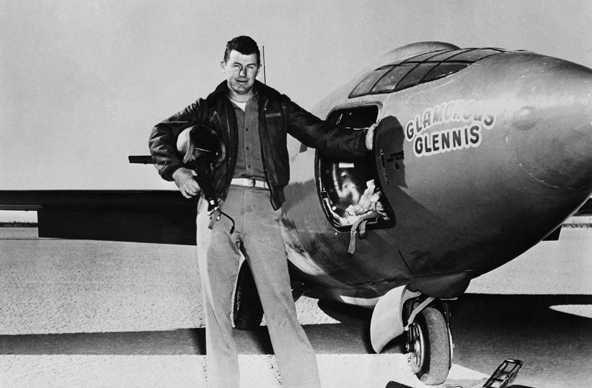 Chuck Yaeger with the Bell X1 in California, 1949. And the thing about being 22 and a college graduate (and the thing about Brian Williams, and Chuck Yeager, and John Glenn, and Walter Cronkite in his time) is that you feel, despite any evidence to the contrary, despite the pollsters and “Girls” and the changing face of NASA, that the world is full of infinite possibilities and even though there are no guarantees, it doesn’t occur to you that you won’t succeed. Here’s to the graduating class of 2012.